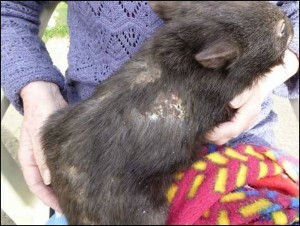 Is often diagnosed as mange. 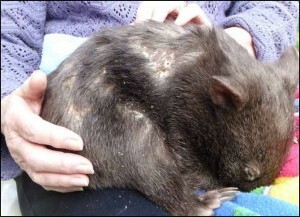 Above: 3kg orphan showing the results of wombat attack. 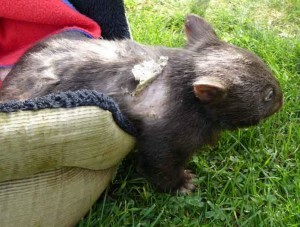 The Mange Management group often receives enquiries about baby wombats with mange. 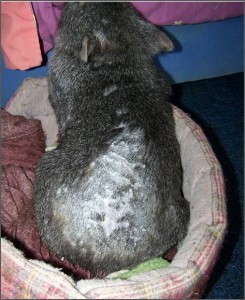 Fortunately, many of these little wombats aren’t suffering from the mange infestation, instead they are suffering from wounds that have been inflicted most probably by an adult wombat. Young wombats from around 3kgs, the size when they are permanently out of the pouch, need to keep up with their mother at all times to be safe. This is called being “at heel” and if you have ever raised a baby wombat you will know what I am talking about. 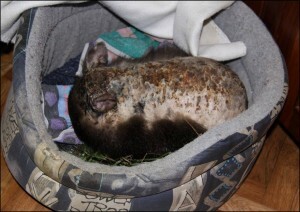 If an “at heel” baby wombat is orphaned it will look for a surrogate mum to follow as it is seeking comfort and safety. Adult wombats do not appreciate another wombats’ baby tagging along as these young orphans can be very persistent and demanding. This is when the trouble starts. Maybe one or two nips to begin with and when this doesn’t have the desired effect the adult keeps biting until the baby eventually recognize this isn’t going to be a surrogate mum and realize they are going to have to go it alone. These little guys can survive for 2 or 3 weeks feeding only on grass which provides some moisture and sustains them for a while. 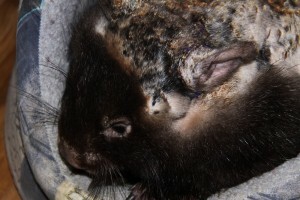 After this period of time they are usually very weak, malnourished, suffering from dehydration and covered in ticks. This is often the time they are spotted out during daylight and rescued. 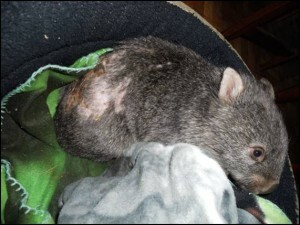 Young wombats like this need to come into a wildlife shelter for care. They still need milk at this age and often the wounds they have sustained are infected and need antibiotics to treat them. These wombats would die if they weren’t rescued. A photo sent to the Mange Management group can confirm if the baby has mange or not and the appropriate action can be taken. On the other hand if these young wombats do have mange and mum is still around they would be best left with their mother and treated on the property using the “pole and scoop” method. We are seeing many positive results this way. Always seek advice if you are not sure of the diagnosis. Read more…..
By the time these young joeys are found they are usually very weak, malnourished and dehydrated. 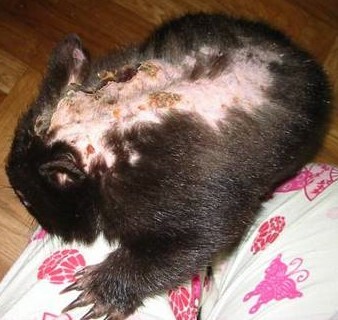 Wombat attack injuries are always noticeable on the wombats back, often from the back of the neck right down to the rump. 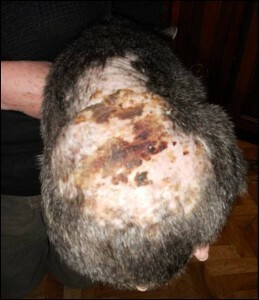 This can show as hair missing and scabs or open sores depending on the severity of the attack. First treat for dehydration Read more………. Check there is no infection under the scabs. This would be noticeable if the wound/scab feels hot or if there is any unpleasant odor. Antibiotics will be needed if there is infection. See your vet if this is the case. These young orphans usually do quite well in care as long as they are diagnosed correctly. Little wombats recovering from this type of injury need lots of TLC and reassurance and once they are feeling stronger a buddy will help build up their confidence. This all takes time. STRESS is the biggest issue when dealing with wildlife. 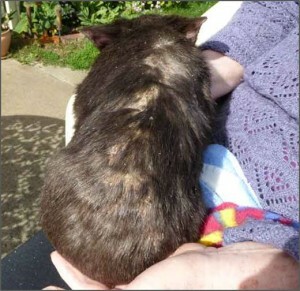 To avoid stress adult wombats are best treated in their home territory and natural environment. 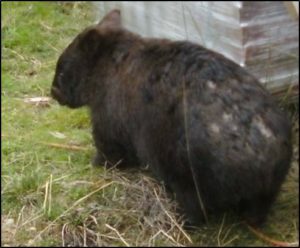 Wombats approaching adulthood and starting to become independent often encounter territorial disputes. 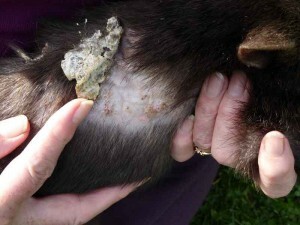 These can be minor with just a few tufts of hair pulled out or quite severe with deep open wounds. Wombats that are under threat will sometimes be seen feeding during daylight as they will be avoiding the dominant wombat. Keep dogs away and leave the wombat alone, they usually move on in a few days. Minor wounds can be sprayed with Chloromide (pink) which is an antiseptic and fly repellent. There are a few different products available (produce store) which will dry the wounds and stop them becoming flyblown. 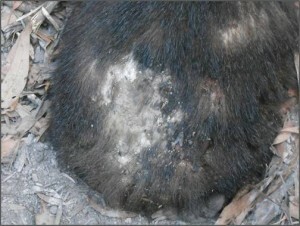 Unless there is a rotting dead smell which would indicate secondary infection the wombat is best left alone. Do not touch or catch the wombat unless it needs veterinary treatment. If there is infection an antibiotic will be needed to clear this up. 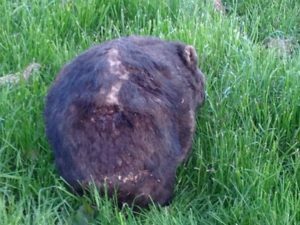 Call your local wildlife shelter or report the wombat (Wildlife Victoria Ph:13000 94535) or Help for Wildlife Mob.0417 380 687.